It’s ready for the oven! Chilean Sea Bass can be found in the southern ocean areas of Chile, Argentina, South Africa, and New Zealand which is probably why this variety cost more than the average fish per pound. If you’ve ever enjoyed it, you know it’s worth every single dime. Back home in Louisiana the variety of fish options seemed to be limited to catfish, redfish, Sac-a-Lait and perch. Once I began to travel, I was able to gain an appreciation for different types of fish that were more prevalent in other regions. And that brings me to this delicious foil-baked Chilean Sea Bass with Lemon Parmesan Cream Sauce! 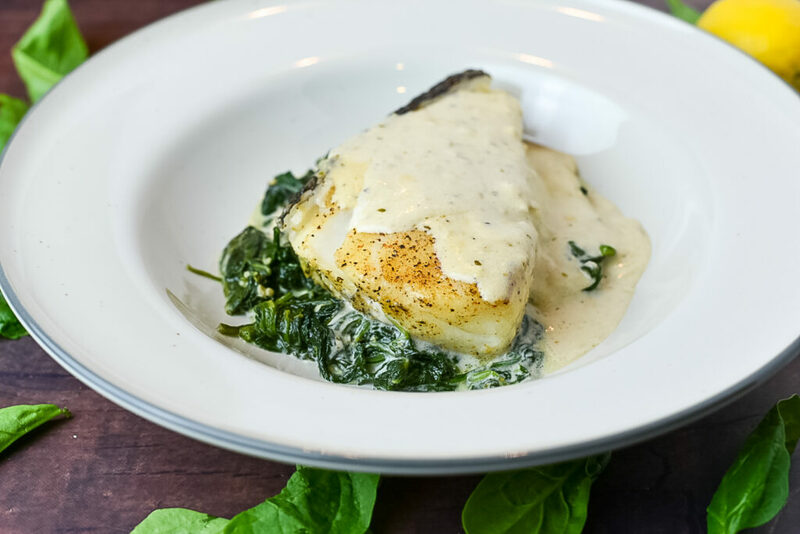 Baking this delicious dish sealed in foil along along with garlic cream spinach adds additional flavor while it steams the fish to perfection. The lemon sauce blended with the Parmesan cheese and whipping cream was a sauce experiment that ended up being a home-run. 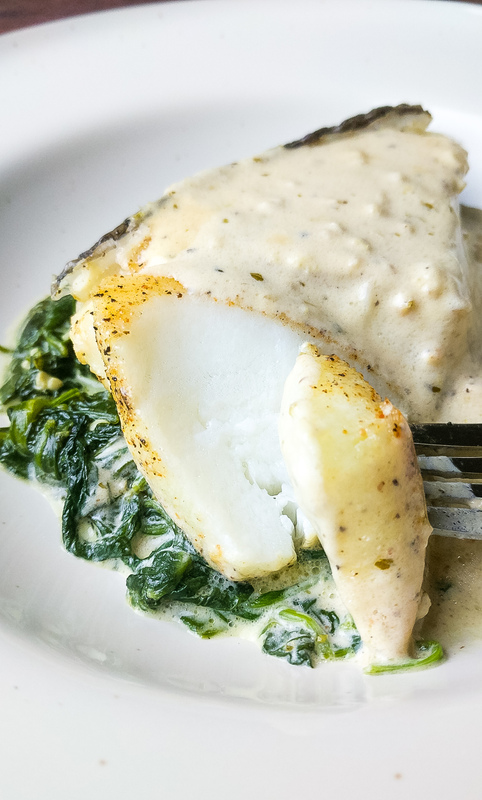 When you want to turn your kitchen into an upscale dining experience give this Foil Baked Chilean Sea Bass with Lemon Parmesan Cream Sauce a try – paired with your favorite red or white wine, of course. Begin by seasoning the sea bass on both sides with sea salt, black pepper and Creole seasoning and set to the side. Pre-heat cooking pan to medium heat and add butter. Once the butter melts, add minced garlic and cook garlic for 1 minute. Add the spinach and pour 1/4 cup of heavy cream over the spinach. Cook spinach just until it begins to wilt but do not over cook. Remove from heat. Tear 2 large pieces of foil and add half of the slightly cooked spinach in the center of each sheet. Place the sea bass over the spinach and seal the foil together so the fish can steam. Pre-heat oven to 400 degrees and cook the fish for 12 minutes within the foil on a baking sheet to prevent leakage. Set to the side when done. While the fish is cooking, pre-heat separate cooking pan to medium heat and add butter. Once the butter melts, add minced garlic and allow to cook for 1 to 2 minutes. Add wine and chicken broth and cook for 3 minutes. Add the heavy whipping cream, parmesan cheese, garlic powder, oregano, black pepper and sea salt. Zest the skin of the lemon into the sauce and slice the lemon in half and squeeze both halves of juice into the sauce. Cook on low/medium heat until it binds together. 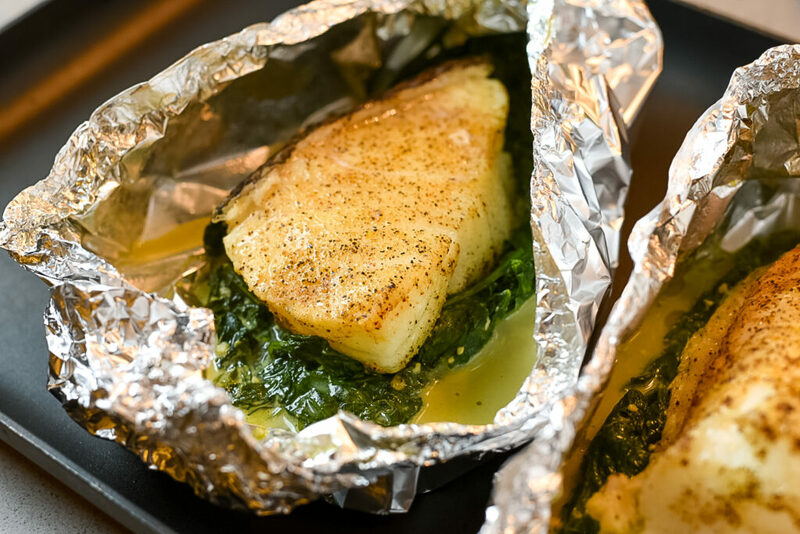 Remove the cooked fish and spinach from the foil. Pour on the sauce. Serve hot. This looks amazing! Sea bass is one of my favorite fishes, but living in Louisiana, we always have catfish and freshwater bass in our freezer. I can’t wait to try this! Thanks a lot Kerri I appreciate it. Yummmm this is exactly my kind of fish recipe! I love foil wrapped fish because the flavors really bake into the fish. That lemon parmesan cream sauce has me drooling! I’m not a huge fan of fish, but must admit, this looks very tasty!!! And I love when culinary experiments go well, that sauce looks soooo creamy and tasty! Perfect to finish the whole dish up. Confession: I’m not usually a fish lover, but I would eat this dinner any day of the week! Perfectly cooked and totally gorg!!! Wow thank you I appreciate that Kelly! This was absolutely delicious. I’m not kidding, I licked my plate clean. I had to use flounder as no sea bass was available; I bet it would be even more delicious with the sea bass! I am totally in love with sauce. Such a flavorful recipe. Looks so perfect! This looks AMAZING. I love sea bass, but it often comes out a little bit flavorless. I think that would be impossible with the garlicky spinach and cheesy sauce that you paired it with, so I can’t wait to give it a try. This looks absolutely fantastic. My fella is Keto and this looks like it would fit really well into his diet. Ok good deal thanks a lot Jenni! 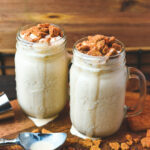 Superb recipe!! We do love our seafood and Chilean Sea Bass is right up there. It is one special fish and I really like how you included the creamy spinach in the foil packet. This is a keeper of a recipe. Will be trying it out soon. Thanks a lot Marisa! Please let me know how it goes. I’m not sure if I’ve tried Chilean sea bass…perhaps I was deterred by the price but will have to give it a try. Your preparation looks delicious! 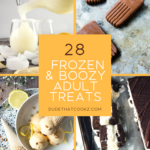 Pinned to my recipes to try board. What a beautiful piece of fish! 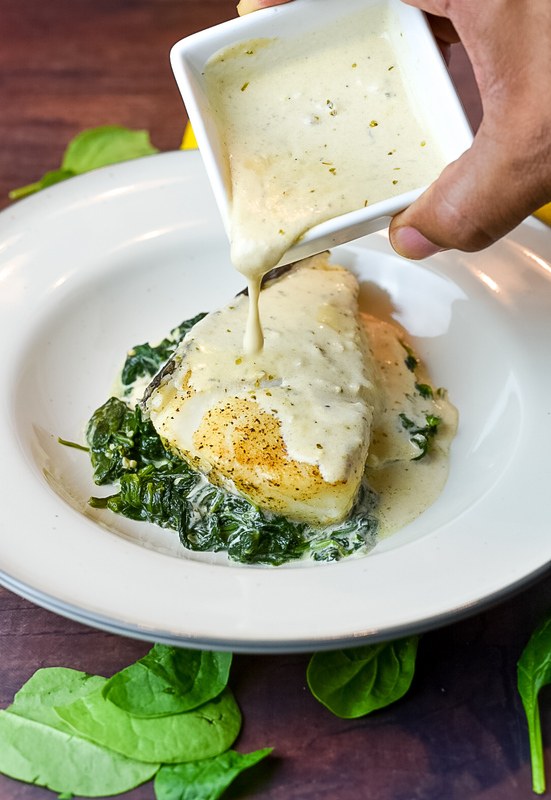 It looks perfect on its own, but your lemon Parmesan cream sauce has me drooling. Any white fish would be just fine Vanessa. Thanks! When it comes to fish, it’s the sauce that firs it for me. And this one is perfection! Absolutely gorgeous and what a perfect recipe. Chilean sea bass is one of my favorites and this sauce is out of control!! Frozen Chilean Sea Bass is sold at Costco in the US. It’s quite pricey, but worth it. I’ll be doubling the recipe for 4 adults. Sounds delicious! Yes it can be a little pricy but other white fish can work as well. Thanks James! This looks so good. I’m trying this tonight. Any recommendations for the white wine , first time cooking with wine? Hello Jasmine! You can actually just go with the “white cooking wine” that you can get from your local grocer. It would be located near the vinegar. Hope you enjoy it! wow sounds delish. cooking this tomorrow for guests. to save time am wondering if it will work with the full filletted fish. will use regular sea bass or nile perch as we dont get the chilean sea bass in my country. Hello Mel! Any white flaky fish will do so regular sea bass or perch would work perfectly. 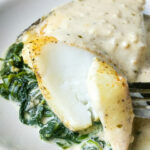 And you should be fine with covering the entire/whole fish filet in foil (on top of the creamed spinach). Enjoy! 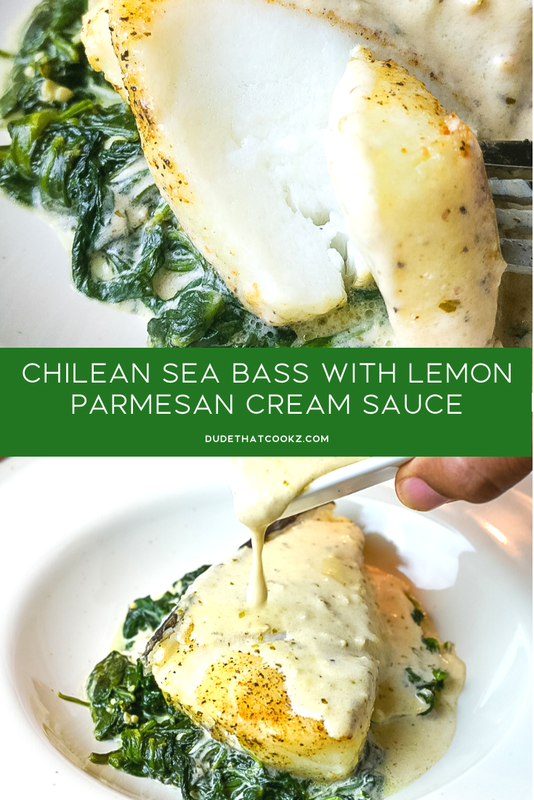 This looks delicious, going to try this out….but what if I don’t use Chilean sea bass and just use regular season bass…will it still turn out delicious? Hello Puja! Absolutely, any sea bass would be equally perfect for this recipe. Thanks a lot Puja! I think it won’t be much of a difference because everyone has their preference so I think it would turn out great. This was delicious!!! It was SO easy to make! We paired it with buttered spaghetti noodles and put some of that yummy sauce over it. We used cod from Costco and it tasted fantastic. (also more affordable option) Very simple directions! We loved it so much we are going to make it again tonight for my parents. Connie this is so awesome! Thanks so much for sharing I appreciate that and its give me encouragement so thanks again!! I have tried several recipes each successful but this one is the best. My wife Karen and I loved it so much that I made it three times in two weeks.Each time I made I knew what I was going to eat the next day. Spaghetti with the extra sauce.My wife fell in love with sauce and decided to use it with spaghetti. That too was a hit. Thanks. Arthur, thanks so much for sharing this. This is what keeps me inspired to continue trying to be creative and try to make good food for food lovers. This is awesome!! Not a big fish cooker so how would I do this with frozen fish? Hello Amy, I think fresh fish would be a lot better. I wouldn’t recommend frozen but if that’s all you have then make sure you allow it to sit long enough to completely thaw before cooking. For ways to elevate our fish dishes and this really hit the mark! This is pretty awesome Cindy I truly appreciate it! !